Reiki is a laying on of the hands, a healing system from Japan. My lineage is from Mikao Usui and I am a Reiki Master Level 3. I believe Reiki is a most underutilized modality in private practice, yet it is standard in Hospitals and Hospice that have Reiki Therapists on staff. It is used there because Reiki is so soothing, yet powerful for healing. In a Reiki session I will lay my hands on various parts of the body as you lay on the massage table, all cozy, under a blanket. A typical treatment lasts an hour. Reiki will go where it needs to go, it is far more intelligent than we are. What I mean by that is if you present with a headache I don't have to lay my hands on your head. I could lay them on your feet and Reiki will heal what it needs to heal. The reason is because our physical pain is not necessarily from the area it originates in. For instance.. you may have a headache but really it is from super tense neck and back muscles. So Reiki gets to all levels and areas of your physical, etheric, and emotional bodies. Reiki has the higher intelligence than we do. We can do a Reiki session wherever you are in the world!! You don't have to live near my office! We schedule a time where you can lay or sit comfortably in quiet, and session is over the phone- so headphones are nice if you have them. I talk for the beginning of session, then part of the session is silence while you take the treatment, and towards the end I gently bring you back into awareness. Distance sessions are great if you don't want to leave your house, and want to drift off after session and not drive home! Distance Reiki is just as effective as in person. 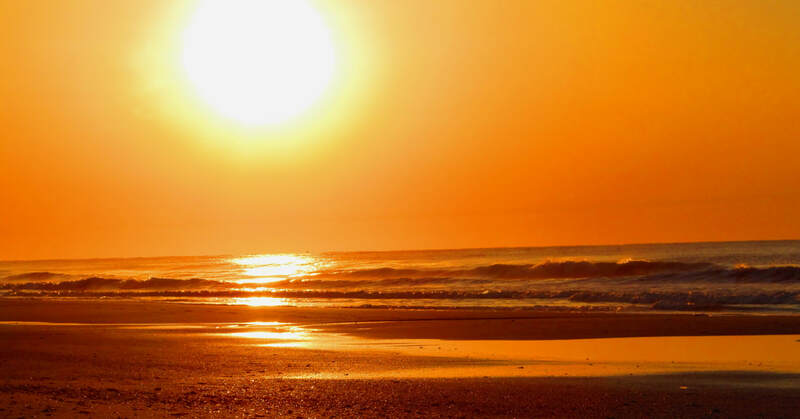 Some clients feel distance Reiki is more effective than in person, as they are in the comfort of their own homes and can just soak up the healing energy and not get up after session! Reiki is also unique in that you can use it on yourself for self healing if you choose to study it. Reiki can also be used for prayer/distance healing.. meaning that I can send out Reiki energy to a person or situation anywhere in the world! You can even send it backward or forward in time! I do Self Reiki everyday, bless food with it, cleanse the energy in my home and office with Reiki, use it with prayer to "send" the healing energy. The uses are endless.. cover your loved ones with Reiki, your pets, electronics, your car, anything you can think of. Reiki is Universal Life Energy that we all have, or in the medical settings, they call it BioEnergy that is documented in medical journals. Give Reiki a try, you'll love it! Then Cupping is for you!! This ancient Eastern modality will get pain out fast! You will feel a difference in one session! Sometimes total alleviation in one session! Sometimes it may take longer. I have had clients with decades of pain, who have tried it all- medication, physical therapy, surgery- and still they are in pain, until they tried cupping. Cupping is that pleasant release you are searching for. Cupping is very relaxing and the results are cumulative. It is fantastic for chronic issues such as back pain, neck pain, headaches, which are stress related. It opens up those stagnant energy channels and lets energy flow freely. Cupping can leave a pinkish or reddish circular mark on the skin. This is toxins leaving the system and nothing to be alarmed about. The marks typically go away within a week or less. I can also do "moving cupping" and it won't leave a mark. Cupping activates the parasympathetic system and puts you in a deep state of relaxation. It is typical for clients to fall asleep during treatment. In my sessions, I typically do cupping along with Table Thai massage. I tailor the session to your needs, concentrating on the areas that are of most concern to you. Expect to feel fantastic during, and also after session! Most of us are familiar with massage on a massage table. Table Massage is commonly done with the client unclothed, or undressed to your comfort level. Undergarments may be worn. You will be properly covered at all times, and should feel comfortable and safe. It is common for clients to become so relaxed that they fall asleep! As sedating as massage is, there is much healing being done on the etheric level. Your guides, angels, and higher self are very accessible at this time. Your healing does not end after the massage. It is a cumulative effect. You take it with you. ​Thai Massage is historically done on the floor, but I've incorporated it into my table massage since some clients don't want to get on a floor mat. Thai Massage goes along with Eastern practices that we are not just parts and pieces, but it works all the etheric bodies.. the physical body, the emotional body, the intellectual body, and the spiritual body. What does that mean to you?... You will feel AWESOME after session! Many people want a reading, but don't have specific questions, (although they do have questions, but don't know how to formulate them) In these cases, I do a Life Reading. It is about all areas of your life.. You personally, your home life, work, relationship, and future. Clients are pleasantly shocked at how the Life Reading will answer those questions they have in their heads, but couldn't quite get out. This is typically an hour. For half hour sessions, I also do readings that just answer specific questions. For instance, "this or that" questions.. "What would happen if I took this job or stayed with my current job? ", "What would happen if I stayed in the house I am in or bought a different house? ", "Would my husband be ok if I decided to divorce him?" "What is my boss's intentions for this meeting?" Sometimes clients want a quick "yes or no", without explanations. That would be your 15 minute session. I do readings over the phone, email, in person at my office, and also do gatherings at homes or business/office that want a reader for their guests. 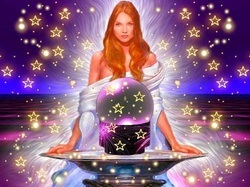 If you want a phone or email reading, call or email me to arrange. Sometimes we will start a massage session and end up doing FasterEFT. Do you have an issue that has bothered you for years? A trauma or bad memory that you just can't shake and you know it is affecting your life? Are you having panic attacks? Can't sleep at night? Or maybe just a habit you have tried to change? Do you feel that Karma is haunting you? Then Soul Coaching is for you! I will guide you to clear it out and give you a tool that you can then use on your own. Yes, we can actually rewrite memories in our brain so they don't bother you! I will show you how. It is a method of tapping on your energy meridians called FasterEFT developed by Robert Smith. If you want to learn more about it, click on the link. He also has plenty of videos on YouTube which is linked on his site. You can watch a video and be tapping within five minutes and clearing your problems and also see results of real people changing real issues. I have seen dramatic results with my clients- changing memories that have weighed on them for decades! Many times people go through traditional talk therapies for years and figure out 'why' they have a problem, but then the therapy can sometimes fall short of 'how' to release the problem or memory. Knowing why you have a problem is good, but what next? That's when clients usually come for Soul Coaching- after they have been through traditional therapies and are frustrated at not getting the results they seek. I see it time and time again in my office- clients will be leaving and they look totally different! Like a weight is lifted off their shoulders! They will comment, "I haven't felt this good in years!" "That was an issue I never thought I'd get over!" "I didn't realize how much that memory was affecting my life!" "I feel like a different person!" "Traditional counseling has never done that for me!" A typical first session is two hours. That gives us time to delve into things. Follow up sessions (if needed) can be an hour or an hour and a half, even just a half hour. We can cover a lot of ground in two hours. FEFT is a tool that will empower YOU, so you won't need years and years of sessions. You may want a few sessions to get any issues that come up, and in that time I will also teach you how to do FEFT yourself AND how to use it out in the real world- in the moment.. Which is what we really need.. Something that works and works fast. A disclaimer- I am not a psychologist or counselor. I am a person who has had trauma in my own life and used traditional talk therapy. I would leave a session and know 'why' I had the trauma, but where was the 'how' to change it? Then I came upon FEFT. And within 15 minutes, a memory that had bothered me for 40 years that I couldn't shake in therapy- was changed! I couldn't believe it! What's even more interesting, is that healing that memory had a domino effect that changed events in my life today! Things that previously bothered me didn't anymore. I knew I was on to something. That lead me to getting trained in FEFT so that I could share the same results with my clients. Here is an example of FEFT and what it can do- Someone was at a doctors appointment. He had water with him and seemed very nervous. I asked him about it and he said he always passes out at the doctors office. I asked him if I could try a simple method on him to calm him down. He said, "Nothing is going to help. I've been this way since I was a child." I told him to please just let me experiment for a couple minutes. I tapped on him for about two minutes before he saw the doctor. He came out later and said to me, "That was amazing! That is the first time since I was a kid that I haven't passed out at the doctors office!" This stuff works. You don't even have to "believe" in it! It works because it is using our own body's fight or flight system. We are interrupting the signals that the memories are sending out. If you want to feel better in all areas of your life, give FEFT a try. Reiki for your pet can be a wonderful part of their medical treatment! I started out in the 1990's doing animal massage before I decided to work on people. Bodywork is so effective on animals! They don't have all the mental blockages that we have! An amazing example is a Dalmatian I had that couldn't walk at nine years of age due to his spine fusing together. Three veterinarians told me to put him to sleep, that there was nothing they could do. I had a chiropractic treatment done on him and he walked out of the office! The chiropractor told me that he would hold his adjustments longer if I massaged him. I thought she was crazy! But I did it, and I noticed that he would start to come to me when he was in pain and turn his body towards me the area he wanted worked on! He lived five more years after the vets said he couldn't be helped! Then I went to animal massage school and after that decided to get licensed to work on people too! I have worked on a pygmy goat and a dog that was half wolf. Sometimes the animals will communicate with me telepathically. That was quite a shock when it first happened! One time I went into a friends house who had no idea what I did with animals. The dog came up to me and positioned his side against my leg where he was hurting and he "told" me clear as day that his owner played too hard with him! I also told the owner to take his dog to the vet right away as there is something very wrong with his stomach. The owner then told me the dog had been having trouble eating. He took him to the vet the next day and they had to put a feeding tube in as the dog had a rare disorder and couldn't digest food properly! My work with animals has evolved into Reiki rather than massage. I have found that Reiki is just as effective as massage for animals and they love it! Animals "know" that you can do Reiki. So many times I've walked into people's houses (not for sessions), and their pet will walk right up to me and lean into my legs to get the Reiki Energy. The owners are astounded and say, "Look at that! He/she's never done that before! What is he/she doing?!" Then I explain they sensed the Reiki and are wanting treatment. Typically it's dogs that will do this, as cats know they invented Reiki, and we poor humans are doing our best to do Reiki as well as cats can. Lol. I have a cat who wouldn't let me give her Reiki for years. Finally I figured out to ask her to teach me- and now she comes to me asking for Reiki.. or rather is teaching me. Lol. The fee for animal reiki is $1.00 per minute from the time I arrive at your location. It is typically an hour, but sometimes animals take in the Reiki energy very quickly and are finished before the hour, and other animals are "Reiki junkies" and would take it in all day! Lol! There may also be a $10.00-$20.00 travel fee depending on where you are located. Do You Have A Loved One Who Is Sick And They Need Some Comfort? Sometimes in the busyness of caring for a family member, loved one, or friend who may or may not be in the passing phase... tension and stress is there. I come to your location and sit with a comforting hand on the patient. I have a unique ability to be an instrument to calm your loved one. It is an unusual ability to connect with someone who is having ongoing physical illness. An etheric soul level connection. Not affiliated with any organization, all my attention is with the patient. There is no charting or notes. Just energy and attention towards your family member or friend. My experience with people in a hospital or home setting usually involves me sitting at their bedside with my hand or hands on them. The patient will usually comment that they feel an “electric” current from my hands or just a comfortable feeling. I specialize in the time that the patient has had chronic sickness. Sometimes family members don’t feel comfortable around a sick person and I can ease that tension with my acceptance. I can feel the persons soul. My presence makes it easier for friends and family members to not be as afraid of the illness process's. I am that "outside" buffer. An example: My friend called me out to the hospital to access her father, she wanted him to be well. The instant I touched his hand I knew he would pass in a few days. He wanted to die but his family wouldn’t talk about it. My presence was the bridge to get them all to let him say he was dying. They were grateful for the few days to get the words of love they all wanted to share. My friend thanked me that they didn’t miss that precious time by “ignoring” he was dying. In one example: My friends father was sick at home in bed with the flu (they thought). The moment I put my hand on him I knew he was dying. I said to take him to the hospital. They diagnosed cancer in advanced stage. If I took my hands off of him, he would call out for me. He said it helped him to relax. He and his family had me there up until the moment he died, as the family could see the difference in him if I took my hands off of him. It was beautiful seeing his soul leave his body when he died. ​The above examples were of people in the passing phase- that doesn't have to be your loved one. Those were just extreme examples. Sometimes having that "outside buffer" of me beside your sick loved one, can give everyone fresh eyes and a new look at how fast they are truly recovering, and will be well soon! Please call if you have any questions and would like some comfort at the bedside of your loved one. The fee for this service is $60 an hour from the time I arrive at your location. 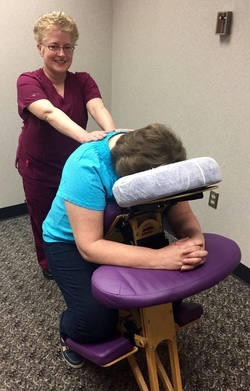 Chair massage is a wonderful offering for your office or event! I will do a 10 minute massage on your employees or guests in a comfortable massage chair. Two hour minimum. A typical arrangement for a chair massage event is that the employer will have an employee be the "host". The host will have a list of the time slots available and the employee will put their name in. The sessions are set at 15 minute intervals, giving the clients 10 minutes of massage within that 15 minute time slot. Sometimes the employer pays for the employee sessions, and in some offices the employee pays for their session. Either way, it is a fantastic break in their day and is so revitalizing! Employees look forward to massage day! Offices normally like to have chair massage once a month.